THE POSTAL DISPENSARIES FUNCTIONING AT SN HIGH ROAD, HEAD POST OFFICE COMPOUND, TIRUNELVELI- 627001 AND AT HPO COMPOUND, BIRDS ROAD, TIRUCHIRAPPALLI- 620001 ARE TAKEN OVER BY CGHS. THESE WELLNESS CENTRES WILL COMMENCE TO FUNCTION AT THE SAME PREMISES w .e.f . 01/04/2019. THESE WELLNESS CENTRES SHALL COVER ALL ELIGIBLE CENTRAL GOVERNMENT EMPLOYEES RESIDING WITHIN 5 KM RADIUS OF THE WELLNESS CENTRES, ELIGIBLE PENSIONERS AND EX-MPs etc. LIVING IN AND AROUND TIRUNELVELI AND TIRUCHIRAPPALLI AS PER CGHS GUIDELINES. THESE WELLNESS CENTRES SHALL BE ADDITIONAL DIRECTOR, CGHS CHENNAI. 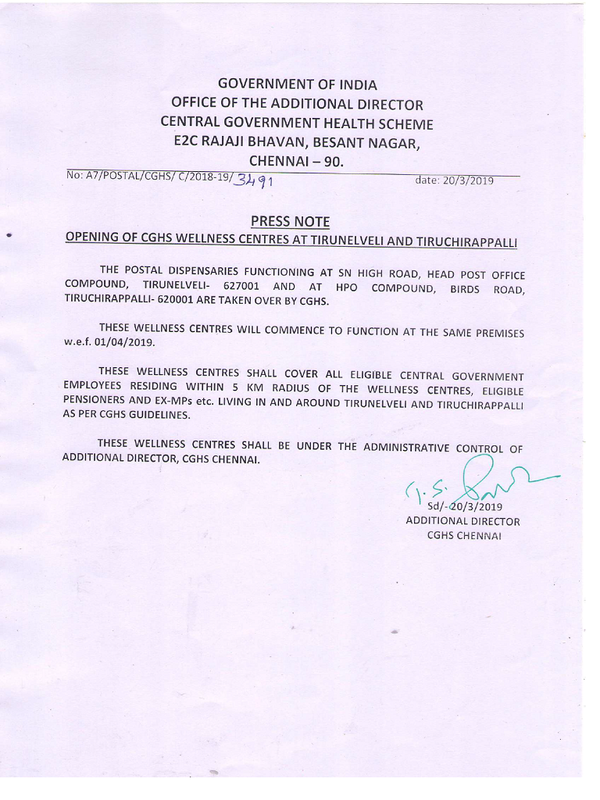 UNDER THE ADMINISTRATIVE CONTROL OF ADDITIONAL DIRECTOR CGHS CHENNAI.